Arkansas’ Symbol of Hospitality is in Eureka Springs. 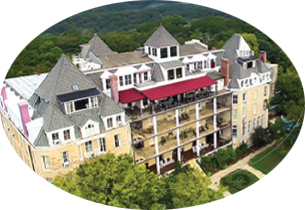 Perched high above the Victorian village on a 15-acre Ozark mountaintop is a Historic Hotel of America, the 1886 Crescent Hotel & Spa. This palatial structure and landmark is known widely as Arkansas' “Symbol of Hospitality”. 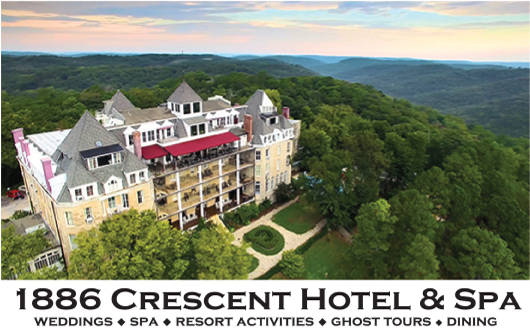 The icon for Eureka Springs' lodging, the full-service Crescent Hotel features 72 guest rooms with upscale suites plus four cabin-like treehouse cottages. Guests of this acclaimed mountaintop spa resort enjoy grand vistas, daily resort activities, hot tub and swimming pool, New Moon Spa & Salon, Crystal Dining Room Restaurant, SkyBar Gourmet Pizza, concierge and bellman service, manicured gardens, and biking and walking trails adjacent to the city's Bark Park, Skatepark, and children's Playground. "Creating Lifetime Memories" since 19th century, the hotel -which is pet friendly- welcomes all visitors while exceeding expectations on weddings, small groups and special events. An attraction in itself, this resort is oftentimes referred to as "America's Most Haunted Hotel". Interesting sights and thrilling tales are common as the hotel shares its history with a compelling archive display, Crescent College Museum, paranormal events and nightly ghost tours. NOTE: tours often sell out, so tickets may be purchased in advance at ReserveEureka.com. Eureka Springs – where accommodations can also be considered attractions! Lodging in Eureka Springs caters to every taste and budget, whether you prefer elegant luxury, a quaint mountain hideaway or a romantic honeymoon suite, a cabin or a bed and breakfast inn. Tent and RV sites are also available. Eureka Springs has a wonderful variety of places to stay. There are many historic hotels, some that were built at the turn of the 19th century! A stay in one of our classic historic hotels is a must to truly appreciate the history of Eureka Springs. Eureka’s population of bed and breakfast inns, storybook cottages and cabins are simply amazing, and a stay at any one of them also qualifies as another “signature” Eureka Springs, Arkansas experience. Like to sleep close to the great out-of-doors? Eureka Springs has hideaways in the hills and by the lakes and rivers. There are “cozy” to very comfortable lodgings to choose from for your outdoor getaway. In the city and all around there’s a wide range of modern motels to fit any budget, from familiar chain names to privately owned lodgings and resort motels with everything, including meeting and convention facilities. And, yes, “romantic hideaways” are a Eureka Springs specialty, from plush hotel and motel honeymoon suites complete with private balconies, gardens and whirlpool baths to mountain cottages, cabins and bed and breakfast inns offering seclusion, Victorian charm, fireplaces and hot tubs for two. If you come frequently to Eureka, you’ll have to try each unique accommodation.